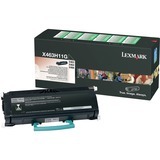 Make a Professional Impression with the Lexmark X463H11G Black Toner Cartridge! Get outstanding results page after page, year after year with the Lexmark X463H11G Black Toner Cartridge. Superior Lexmark design means precision pairing between printer and cartridge for value, quality and environmental responsibility you can count on. Going green has never been easier. Recycle all your used Lexmark supplies by letting us take care of the details. It?s simple, smart and always free. Lexmark Return Program Cartridges are sold at a discount versus the prices of regular cartridges in exchange for the customer?s agreement to use the cartridge only once and return it only to Lexmark for remanufacturing or recycling. Regular cartridges without this license/agreement sold at regular prices are also available.